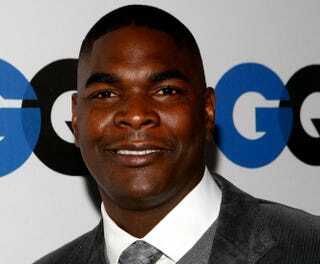 Former NFL wide receiver Keyshawn Johnson was arrested and released early Monday morning on charges that he assaulted his girlfriend during an argument, TMZ Sports reports. According to the gossip site, the outspoken ESPN analyst and his girlfriend were arguing about marriage when things got physical and Johnson allegedly smashed her phone, causing a cut to her hand. Police were called and Johnson was arrested and later charged with misdemeanor domestic battery. Johnson was released on $20,000 bond. Johnson made news not long ago for almost coming to blows with bodyguards for his then-neighbor, pop star Justin Beiber. During his 11-year NFL career, Johnson played for four teams including the New York Jets (who originally drafted Johnson first overall in 1996), the Tampa Bay Buccaneers, the Dallas Cowboys and the Carolina Panthers, according to SI.com. Johnson amassed impressive career totals of 814 receptions, 10,571 receiving yards and 64 touchdowns, though many believe that he never lived up to being taken No. 1 overall. ESPN has not issued a statement regarding Johnson's arrest and it is unclear what impact if any the alleged domestic dispute will have on his current analyst job with ESPN’s Sunday Morning Countdown. Read more at TMZ Sports and SI.com.